Members of the Albany Volunteer Fire Department dove into a stock tank east of Albany Monday to recover a pickup truck after a crash. 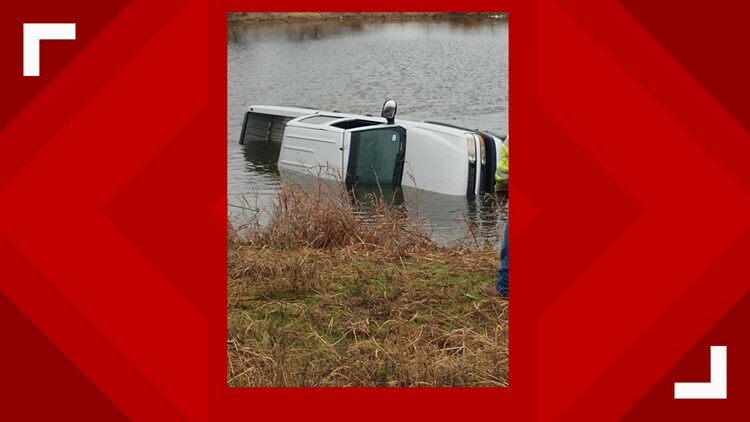 ALBANY, Texas — Rescue swimmers from the Albany Volunteer Fire Department recovered at pickup truck from a stock tank Monday, after it was driven into the water. According to the Albany VFD Chief, Kyle Tischler, the department responded with rescue units at approximately 1:45 p.m. Monday. The truck was at the bottom of the body of water, located east of town. The driver was not seriously injured, Tischler said. Albany VFD rescue swimmers, Asst. Chief Travis Gardenhire and Firefighter Joel Viertel, were involved in the vehicle recovery. The group swam out, dove down and attached the wrecker's cable to the vehicle. "Mind you it was cold and raining. These guys were cold but they succeeded. I thank these guys and the ones behind the scenes for doing what they do." Tischler said.